Higher Education Whisperer: How did we let the Digital Surveillance Economy come into existence? How did we let the Digital Surveillance Economy come into existence? Dr Roger Clarke will speak on "How did we let the Digital Surveillance Economy come into existence? And what can we do about it?" at the Australian National University in Canberra, 5.15pm 18 July 2018. Abstract and presentation available. From a technical point of view the answer is straightforward. There is a large body of research on how to mine records of consumer's online activities to find out what products they might like to buy. This research extended into suggesting product to buy based on their social media "friends" profiles. This then extended to influencing behavior. The problem seems to be that the tech people did this research without input from policy makers or researchers. At the moment I am taking part in the "Assessing Deliberation: Methods Workshop" at the Centre for Deliberative Democracy and Global Governance , University of Canberra. There appears to be a disconnect between what these researcher do to look at how decisions are made and the work by tech researchers. Those who look at decision making and policy seem to still think in terms of people face-to-face, in debating chamber. 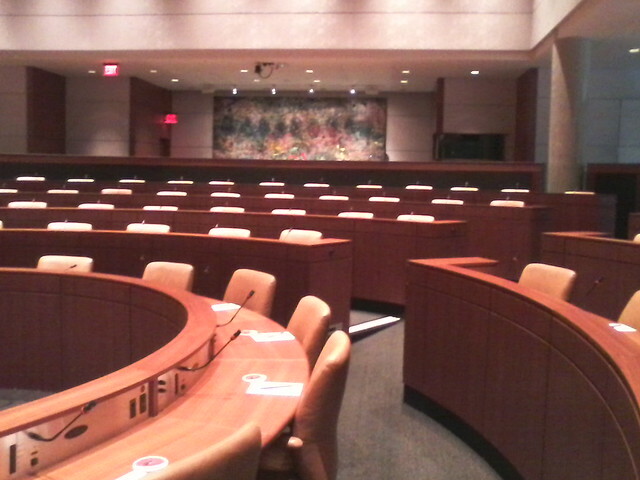 In 2014 I stopped off for a look at the SFU Morris J. Wosk Centre for Dialogue. This is a circular parliamentary style chamber, purpose built for involving the public in decision making. However, this is something from the steam age of decision making. Are live lectures better than videos? China’s Education Boom: A Golden Opportunity? Who reads the Higher Education Whisperer?